The two year extension of the R & D tax credit came at perfect time for the clean energy sector. As the clean energy sector continues to grow it confronts technical barriers that require solutions if it is to continue on its growth trajectory. This article provides a brief summary of some of the major technical challenges where the R & D tax credit can play a major role in supporting these important initiatives. In many cases there are competing technology solutions where further development and the examination of alternatives will eventually lead to the business winner. The immense amount of solar radiation reaching Earth daily is sufficient to satisfy our global energy demand many times over. 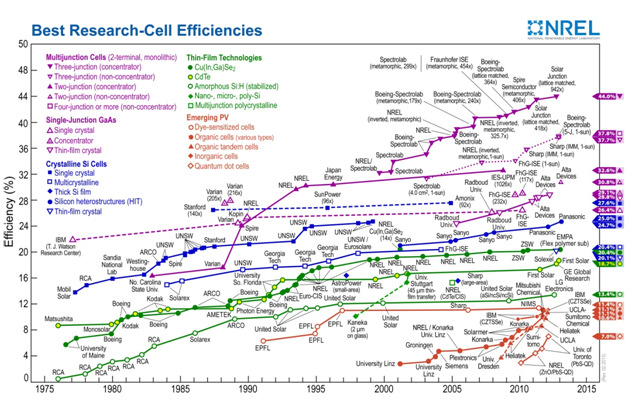 As a result, photovoltaics have become one of the most competitive areas of renewable energy R&D over the past decade. Traditional "single crystalline" silicon panels have steadily increased in their solar harvesting efficiency to around 20% and have also seen materials decreases in price. Meanwhile, a large percentage of solar cell research has been focused on alternative photovoltaic materials and architectures. Amorphous silicon, commonly used in newer "thin film" panels, is highly cost effective. Thin film panels such as dye-sensitized solar cells, as well as organic and inorganic thin films have all led to large increases in efficiency while providing other novel and innovative properties such as mechanical flexibility and ease of fabrication. Today's cutting edge solar cells are a result of uniquely engineered architectures. As the field matures, it comes closer to approaching the holy grail of grid parity - the point when an alternative energy source can generate electric that is equal to the purchasing cost from the grid. Despite the tremendous improvements in the yield and cost of photovoltaics, large scale adoption of solar and other renewables face another fundamental problem: intermittency. Factors that can affect the regularity and dependability of alternative energy generation include: location, season, and time of day. Intermittency poses problems to end users who depend on reliable access to power, but it also affects communities at the grid level insofar as it is a detriment to forecasting. The ideal solution to this problem is cheap, high-capacity, long lifespan energy storage. Improvements in grid-level storage not only facilitate the integration of clean energy technologies, but also make renewable energy generation more economically viable. Excess energy generated during off-peak demand periods can be stored and sold during peak demand periods, dramatically increasing revenues for solar and wind arrays. A tremendous amount of R&D has thereby been focused on traditional, electrochemical batteries. A recent, innovative example is a liquid metal battery that can be assembled in parallel with other like batteries to the size of a shipping container. However, many other alternative clean energy storage techniques have begun to be explored and implemented. One of the most common methods, pumped-storage hydroelectricity, uses excess or off-peak energy to mechanically pump water from a low elevation reservoir to a higher elevation. This energy, now in a potential state, can be reclaimed subsequently through a standard hydroelectric turbine with an efficiency over 80%. Unfortunately, this requires high capital costs and either large volumes of water or elevation differences to maximize the benefits. A similar technology, compressed air storage, utilizes excess energy to compress air and store it in a cold, high pressure environment, such as an underground cave or old mine shaft. When the energy is needed, the gas is slightly heated and an expansion turbine regenerates the stored energy. An additional technique is thermal mass storage. Non-peak energy is used to heat a substance (water, concrete, clay, etc) in a well insulated environment. Afterward, the energy is recovered through spontaneous heat flow and a heat engine, such as a steam turbine. One major problem is finding materials that are thermally stable at the extremely high temperatures needed to maximize efficiency. Events both domestic and international have brought America's need for reliable, long-lasting mobile power into start relief. The U.S. military presence in Iraq and Afghanistan has included outposts in some of the farthest reaching, most inhospitable regions of the globe. Deliveries of gas among other provisions are predictable, which makes our military vulnerable to insurgents who can predict, sometimes with ease, where and when shipments will take place. Consequently, the Department of Defense has identified mobile power innovation as a key way by which American defense can be more nimble and less predictable. Domestically, Hurricane Sandy is only the most recent example of how extreme weather can have catastrophic ramifications for power supply. Beyond mere loss of comfort, power outages can have deadly consequences as weather victims seek medical treatment and relief from the elements, among other reasons. The benefits of mobile power innovation are exciting. In health care, physicians using tablets and other devices supported by better mobile power will have far more tools at their disposal and the option for many more intervention points during the patient care cycle. In addition to outposts sustained by better battery life, the U.S. military is looking into mobile data centers which can be set up on the fly to provide the military and first responders with immediate connectivity. The next generation of mobile power includes miniature fuel cells and batteries as well as wireless recharging technologies including solar harvesting. Governments and the private sector provide mobile power start-ups with meaningful financial backing in recognition of the industry's value. Firms engaged in the development of new or existing products also have a strong factual basis for federal and state R&D tax credits. Historically, the electrical grid was centralized and unidirectional - power plants strategically built around fossil fuel sources transported electricity over large areas, accruing significant cable losses, but were still cost effective. However, as the system has grown, it has become a complex, interconnected network; Wind and solar installments, both commercial and residential, have led to a much more distributed generation grid. These enhancements have created a demand for improved electronic communication, metering, and control. Market-enabling, allowing communication between suppliers and consumers to maximize their operating usage and pricing. One abundant and reliable but largely untapped source of renewable energy is geothermal. Thermal energy is generated and stored in the earth's crust. Geothermal electric plants tap into deep pockets of steam or high-pressure superheated water to run a standard turbine. Afterwards, cooler fluid is pumped back into the Earth to replenish the aquifers for future use. Geothermal power generation offers many benefits over other renewable sources: next to no emissions, no fluctuations in generation, and no need to transport fuel. However, because thermal energy is very disperse near the surface, prime generation sites are often remote and difficult to identify. Also, considerable care must be taken to manage the hot reservoir to prevent overuse and maintain efficiency and sustainability. Today's geothermal R&D involves better exploration technologies, drilling methods, energy management, and new technologies that utilize fluids with lower boiling temperatures in order to incorporate more diverse heat sources. When fossil fuels are burned, spent carbon can be captured and then reacted with hydrogen to make useful fuels such as methane or ethanol. Currently, the primary source of sequestered carbon is power plant flue-gas emissions. Unfortunately, the sequestration process can account for up to 25% of power plants' internal energy usage, greatly reducing the efficiency and capacity. Therefore, there is a huge incentive to support R&D in this field. The most important research has been focused on catalysts, in order to promote carbon sequestration, as well as higher yield hydrogenation reactions. Some researchers have also begun to explore alternative emissions sources, such as automobile, train, and airplane exhaust. Biofuels represent a similar concept: carbon dioxide is captured, reacted with other compounds, and then put to useful purposes such as photosynthesis. Biofuel such as ethanol has a variety of uses including as a blend with gasoline to power automobiles. Many energy providers including major oil companies, have started research into different feed stocks, for example biofuels made from general domestic organic wastes or algae grown in areas that does not displace land for food production. Rising oil prices, national security and climate change are some of the major drivers of clean R&D. The R&D tax credit is a major way by which innovators in this space can recapture some of the expenses relating to their innovation. Few areas of innovation are so critical to our nation's progress.